The final build of iOS 5 was jailbroken in a matter of hours after its release, it happened majorly due to the fact that the final and the Gold Master candidate builds were exactly the same, hence the tools which were already available for jailbreaking iOS 5 GM could jailbreak the final build of iOS 5 as well. And today, the FireCore team has released updated version of Seas0nPass jailbreak tool which supports the second-gen Apple TV jailbreak on the latest firmware 4.4.2 build 9A336a. Before we move forward, keep in mind that this is a tethered jailbreak like any other jailbreak for the latest firmware out there, which means; if you want to restart your device, you will have to boot it into the jailbroken state again whilst hooking it up with your PC or Mac. It’s a small price you have to pay, but hey, you get your jailbreak fix don’t you? All set? Let’s begin! 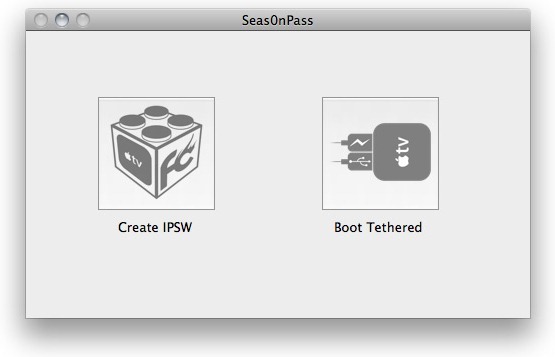 Step 1: Download, install and then launch Seas0nPass for Windows or Mac. Step 3: This step is automated, Seas0nPass will download all the files necessary to create the custom jailbroken firmware for your Apple TV. hold the ‘MENU’ and ‘PLAY/PAUSE’ buttons for 7 seconds simultaneously from your Apple TV’s remote. 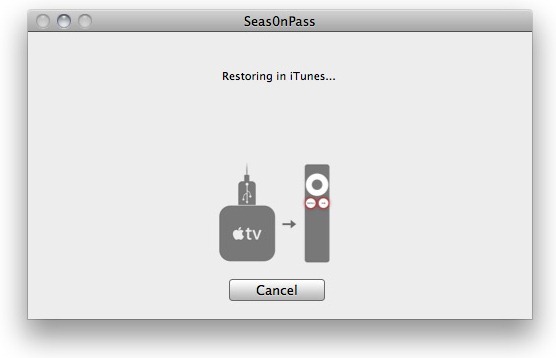 Step 5: If you performed Step 4 correctly, iTunes will start automatically, Seas0nPass will do its thing and go ahead with the restore in iTunes. Step 6: Once the process is complete, iTunes will confirm that the restoration process was successful and you’ll be jailbroken on firmware 4.4.2. As we mentioned in the beginning of this guide; this jailbreak is tethered, so in case your Apple TV loses power or you wish to restart, you will have to boot it into the jailbroken state again. 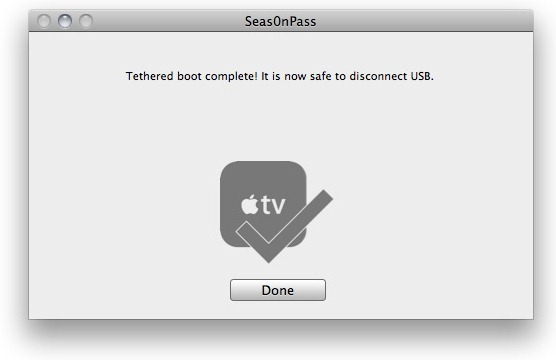 Step 1: Launch Seas0nPass and click on the ‘Boot Tethered’ option. Step 2: When asked to, connect your Apple TV to your PC/Mac using the micro-USB cable, but keep the power cable disconnected. 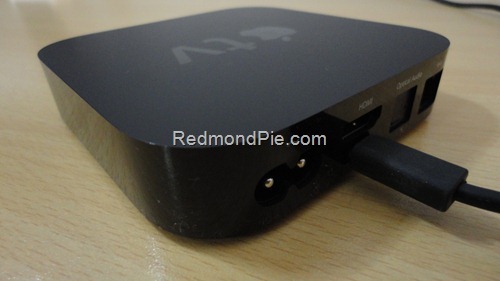 You should now see a rapid flashing light on your Apple TV, connect the power cable this time. 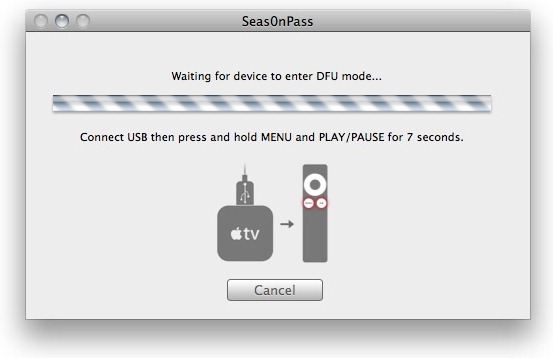 Now put your Apple TV in DFU mode when both the micro-USB and power cables are connected by holding down the ‘MENU’ and ‘PLAY/PAUSE’ buttons for 7 seconds simultaneously on your Apple TV’s remote. Step 3: Rest of the process is automated; Seas0nPass will do its thing and you’ll boot into the jailbroken state in a short period of time. Simply disconnect the micro-USB cable when done and plug the HDMI cable back in.